Cycle breakers: Those who come from childhoods with struggles such as abuse, dysfunction, control, blame, shame, addiction, or neglect… but they break the cycle. There’s no doubt that there is generational influence has an impact. Our parents and grandparents choices influence our own. But we are not destined to make the same choices – that includes their mistakes. We have power and we can be instigators of significant change! If you’re reading this you probably at least have moments where being a cycle breaker and parenting in a connected way feels hard. 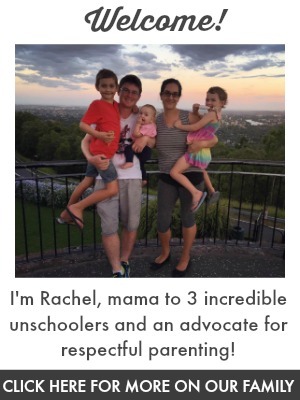 Writing a blog about respectful parenting gives me a unique perspective as I get to know so many of you, the cycle breakers. Communities like ours online are so helpful for us to feel like we are not alone. There are so many of us, just like you who are parenting against the grain too. We hear you, we see you, we have similar struggles and you are not alone. Something I always say about respectful parenting is “it’s not about perfection, it’s about intention“. We all make mistakes. What matters is what we do next. What it really comes down to is being honest with our children about our intentions in parenting, apologising when we do mess up and working as a team. Aim high, it is our children after all. But don’t bully yourself over not being able to be 100% what you want to be. I know you love your children, I know you know what they deserve. I know you can’t always be everything you want to be. But you are enough. So enough. It’s cliche, but it gets easier. I promise. Respectful parenting can be hard, particularly for those of us who were not raised similarly. Sometimes we wish we could have a clean slate – to parent without having to unlearn and re-parent ourselves. But that’s the gift we are giving our children! Our children will have freedoms we didn’t because of having things like their self-worth intact! “Conscious parenting is activism and activism is hard. Activists are cycle breakers. Breaking cycles requires deep change and that takes time. So activists need a lot of patience. It can be deeply painful. So we need the ability to bear great pain. It is often exhausting. So we need to be good at loving ourselves and taking care of ourselves. Conscious parenting is activism. You are changing the world.” – Vivek Patel from Meaningful Ideas. In order to respectfully parent in a society where the majority disagree about children’s rights, we have to be strong. You are strong! Sometimes it can feel like you can’t do this, but you ARE doing this. Breaking the cycle of punishment, shame and disrespect is so powerful! Your choices are not just impacting your children but families around you, your children’s children and society bit by bit. What you’re doing in this intense and amazing job of parenting, matters. Every single time you choose empathy, it matters. Every single time you choose connection over correction, it matters. Every single time you do not punish your children, it matters. Every single time you validate your children’s emotions instead of dismissing/belittling/shaming, it matters. Every single time you show your children you trust them and respect them, it matters. Every single time you protect your child’s rights, it matters. Being child-respecting parents is a gift to the world. Truly. How much of the hurt that people inflict on themselves and others is influenced by how they were treated? Hurt people, hurt people. How many incredible people are held back by the scars of how they were raised? How much negativity is a byproduct of cycles of abuse and dysfunction? Thank you for opening yourself up to growth. Thank you for knowing that misbehaviour is a signal, not an offence. Thank you for taking the time to learn about parenting when triggered. Thank you for recognising that obedience isn’t the goal. Thank you for trying again and again. What Is Respectful Parenting? How to Respect Your Child’s Rights How Many Well Intentioned People Dehumanise Children What DO we do Instead of Punishment? Your blog has been exactly what I needed this month. Thank you. Thank you. Thank you. Thank you so much for this. I really needed this. It’s getting so hard lately, so many times i feel like i’m not the parent i would like to be for my child. But i love our connection so much. I love my family, i love living with them, i love that they’re my life. I’ll always be working on myself to be a better person and a better parent. And reading your blog helps a lot. Thank you thank you!! This is beautiful. Thank you for being a wonderful voice of change to the world. Crying! Thank you for the encouragement! Thank you for this. I needed to read it so much today. Most days I find myself being patient/empathetic/respectful/snappy/tired/triggered but unable to catch myself until after/ all in the space of a few hours. Sometimes I go to bed (single parent) and the weight of responsibility feels so heavy that I wonder if I’m making any progress at all. I have to hope that the times where I manage to be the kind of parent I know my kids deserve are enough to outweigh the times I snap and act unconsciously. Thank you for the reassurance and empathy. I am so new to this. I have a hard time with it trying to unlearn what I learned from my parents. I feel like that alone is improvement. I want to keep learning and have a long way to go. Thanks for writing and showing parents a new way. I don’t want to burden my daughter with my issues. I want her to grow up confident, strong, self assured, and independent. My parents beat the crap out of me and my siblings when I was a kid. My mom hit me in the face with a belt until the buckle broke the skin and I had blood running down all over my t-shirt once. As a parent of a 1-year old girl, she’s so precious to me that I would throw myself into the wood chipper before I hurt her. So, cycle breaker? Yes, you could tell I’m one of those.